We had a good night's sleep on the edge of Dartmoor, but woke to find the weather had deteriorated, as per the forecast. 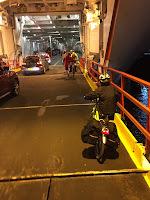 There was no point hitting the road early, only to end up with many hours to kill, in dodgy weather, at Plymouth ferry terminal. Fortunately, things were expected to pick up, and in any event, Toby and Nicky had very kindly offered to show us their amazing collection of vehicles. 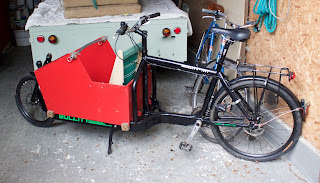 The one thing we don't have at home, that I wish we did, is a garage, to store bikes and allow me to tinker with temperamental little Peugeots under cover. 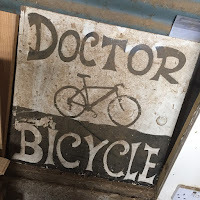 We have a lovely big basement, slowly drying out after years of mistreatment by a former occupier, but you struggle to get bikes down there without scratching them, never mind park a car in it! 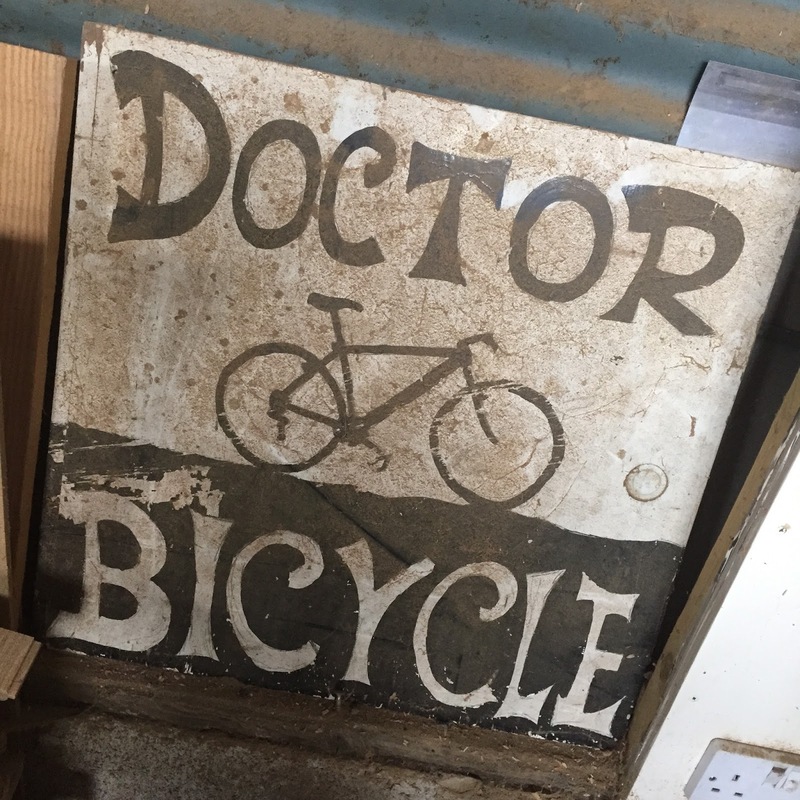 Aside from Toby's simply stunning wood workshop, we were shown bikes for every conceivable situation, before being led into a garage with the matchless aroma of petrol and oil. 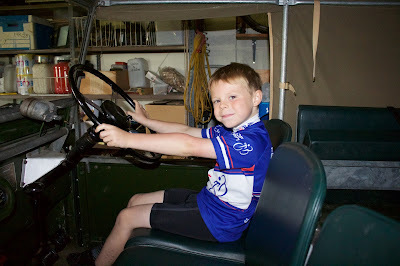 Little did I realise, as Thomas Ivor posed for pictures round Toby's lovely early 50s Land Rover, that he would wind up riding in it before the day was out. Toby and Nicky have not only been very kind in extending an offer to accommodate us, strangers known only as fellow cyclists with children, but have really inspired us with their use of their bikes for every day utility, not just a holiday conveyance. John, their son, took a keen interest in our trailer, and Thomas Ivor's Islabike, whilst we saw tandems, tourers, racers, an antique trike and even a cargo bike. Everything is substance over style, and their kit clearly 'just works'. Smart as our matching Trek frames and Ortliebs may look, we are already having a long, hard think about some of the clever and evidently hard-working cycling solutions we've seen. 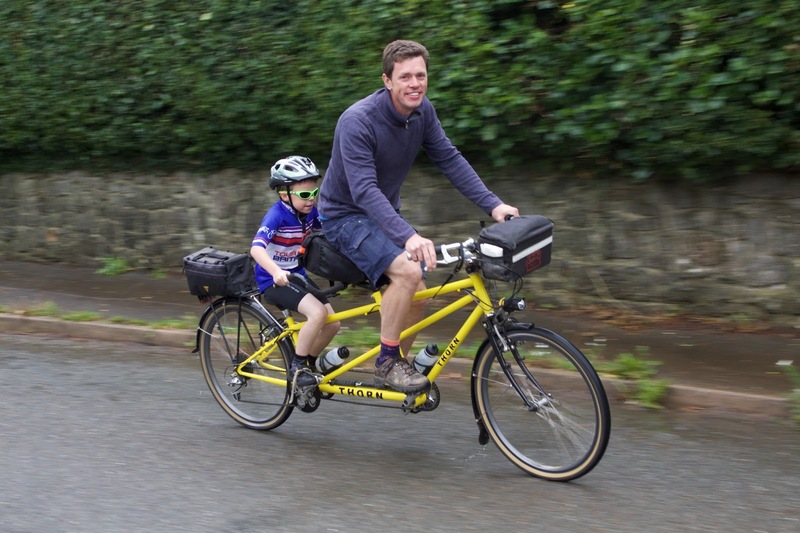 The highlight for Thomas Ivor was his first ride on a Tandem - Toby and Nicky have a Thorn 'Child Back' which they use to take John to school. 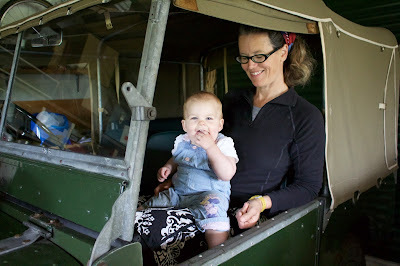 A pair of these in three or four years' time might be just the ticket for us with the girls! 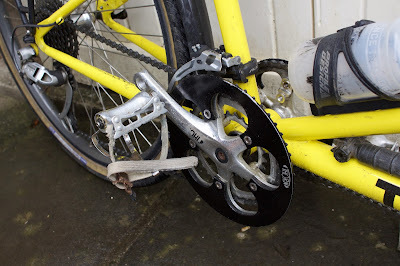 John's stoker seat also featured cleverly shortened cranks, tapped out to allow the pedals to be moved later on. In return for letting Thomas Ivor try his seat, John was treated to a trip in the Croozer, which went down equally well! Turning to our bikes, Thomas Ivor pointed out that I had a flat rear tyre - and depressingly, he was right. First one the bike has had! It transpired that something had apparently got inside it when the spoke was changed afterwards, as the shard of metal had not pierced the tyre. 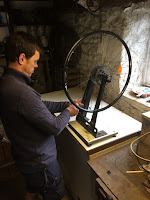 After the events of yesterday afternoon, Toby very kindly also put my wheel in his alignment jig and got it straight and tensioned for me, whilst we repaired the tube. We couldn't have been in better hands and we were so grateful to be setting out for Plymouth with the best possible prospects. The time came to set off, all too soon, and we bade farewell to Toby, Nicky and a rather put out John, who wanted to come with us! 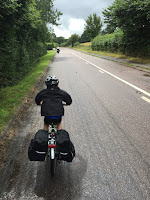 The damp conditions made for a tricky descent down the narrow, hedge-lined 'Devon lane' to the main road, but by the time we reached the old road to Buckfastleigh, the surface was drying in the breeze. Taking my first stint with the trailer, I pushed on into a dip, trying to gain enough momentum to 'slingshot' us over the top of the next crest. 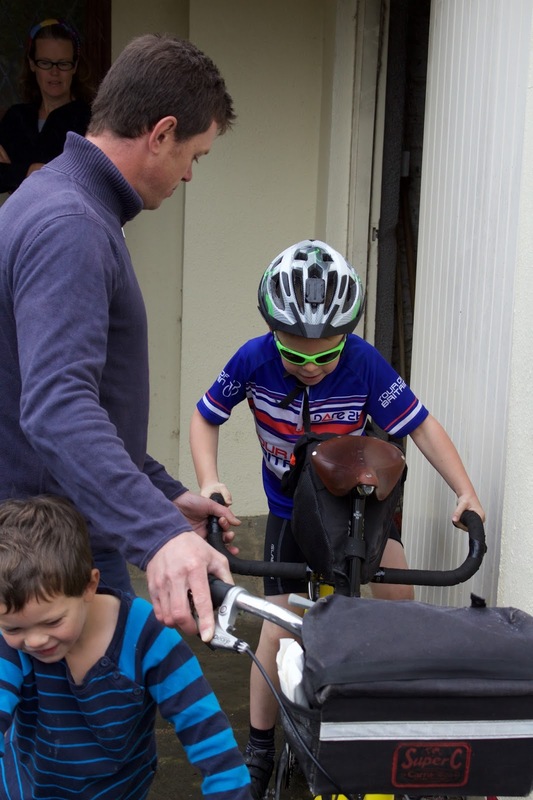 Katie dropped onto Thomas Ivor's wheel to coach him at a more sedate pace. Just before I reached the top, I heard a loud, pained cry. 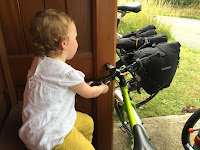 I toiled feverishly up the last few yards of the climb and pulled off the road. Turning round, there was Thomas Ivor, being picked up off the road, with a car very close to where he'd landed. I turned the trailer and sped back down the hill as fast as the load would let me. Despite appearances, I quickly discovered that the motorist had simply arrived at the scene after the accident happened, and was rendering assistance. He'd not been hit. Phew. Fortunately, not only did Thomas Ivor have a perfectly lucid recollection of what had happened, but Katie had of course seen it unfold right in front of her. He'd caught a seam in the surface where the road had been repaired, and at about 15mph it had pitched him off. Not really the lad's fault, but no consolation for him. He'd bitten his lip in three places as he'd landed, and whilst his helmet had done nothing for him (not a mark on it apart from a minuscule scuff on the plastic visor) he had a bump on the forehead and some other knocks and grazes. He had a wobbly tooth, but after some debate it was concluded that this was a milk tooth which was probably due to come out as it was! 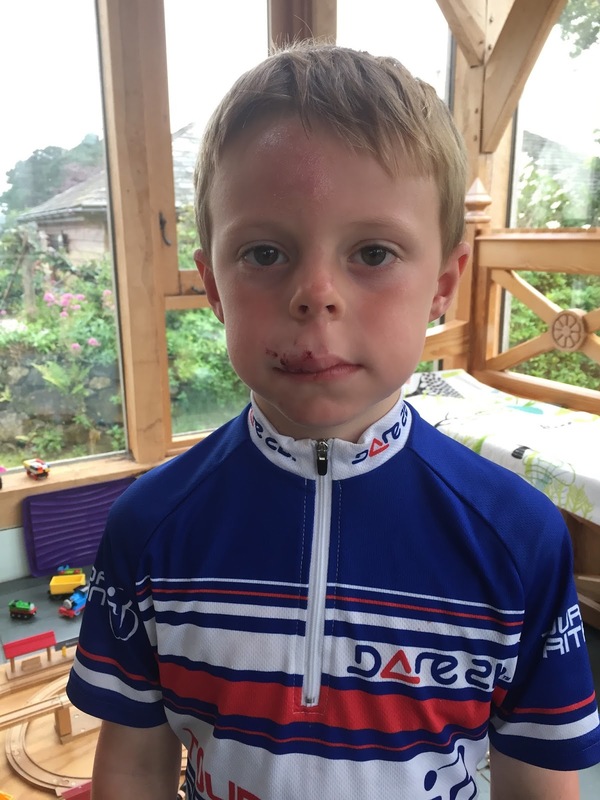 Thomas Ivor hadn't had a proper fall from his bike before, and temporarily forgot that wailing and gnashing of teeth wouldn't soothe his wounds, which made things a little more testing. We needed to be certain he was ok - not only because we were about to leave the country and do some serious miles, but because when you are a separated parent, an accident or serious illness in your care is one of the worst occurrences possible. 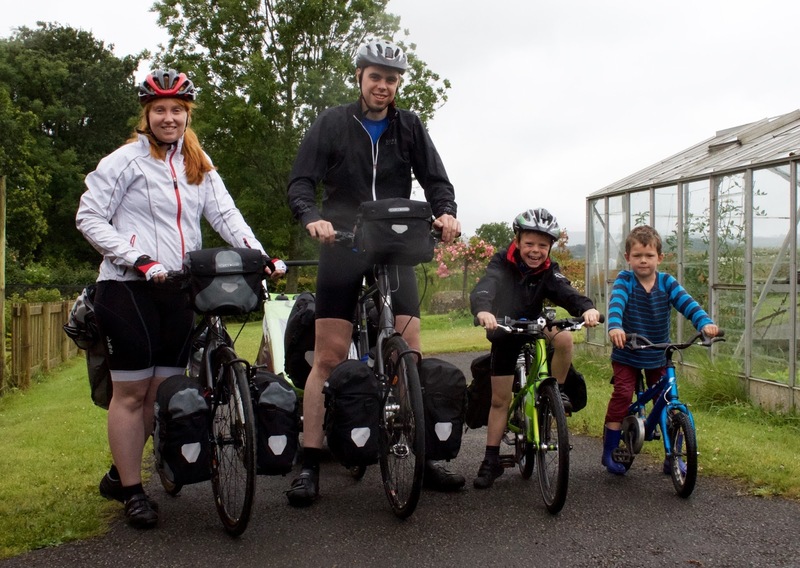 We felt awful doing it after all the kindness and time they had given so far, but it seemed most prudent to give Toby and Nicky a shout for some help. Before we knew it, Thomas Ivor was back at their house and I was cleaning him up whilst Katie and the girls were brought back with the trailer in the trailer, as per yesterday. 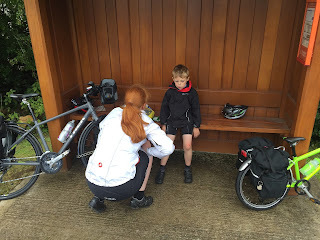 In the aftermath of the accident, Ruth had sat in a bus shelter, very concerned for her brother but most of all for his bike, and 'Beinn' was suitably 'mended' by the laying on of little hands. Newton Abbot minor injuries unit was not somewhere I'd planned to visit on our trip, and I probably wouldn't have done so were it not for the specific circumstances, but with time now ticking to departure time at Plymouth, we had to be absolutely sure and cover our backs to regain some confidence. Praise God for the lovely nurse, a fellow cyclist, who triaged the little chap and prescribed getting back on the bike - which was far more helpful than the dramatic 'Oh my GOD!' he had from someone else who should have known better. We left the hospital having been seen promptly and efficiently, with an impartial opinion that we should carry on with our adventure - and Thomas Ivor with a 'trauma teddy' (knitted by the WRVS I think!) 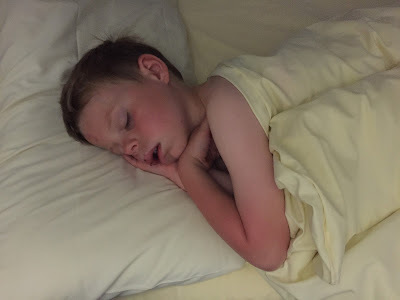 - they chose him one specially with a yellow jersey - who has joined our team and been nicknamed 'Froomey', in honour of today's winner on the Champs-Élysées. 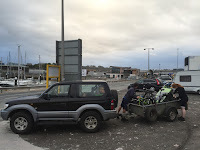 A ride in the Land Rover later, we were all back together again at Toby and Nicky's house, and wound up arriving at Plymouth just as we had left Teignmouth yesterday. 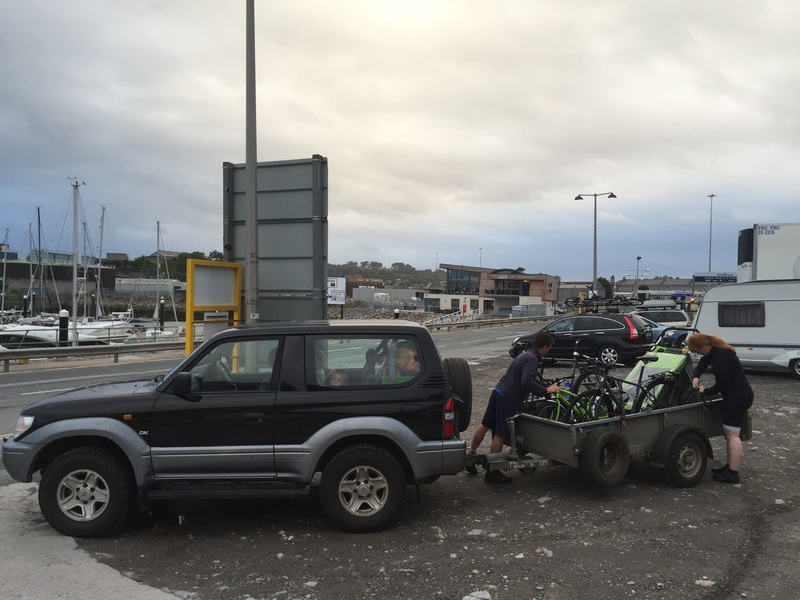 We cannot thank the guys enough for giving up much of their weekend and deploying their resources to save our trip. 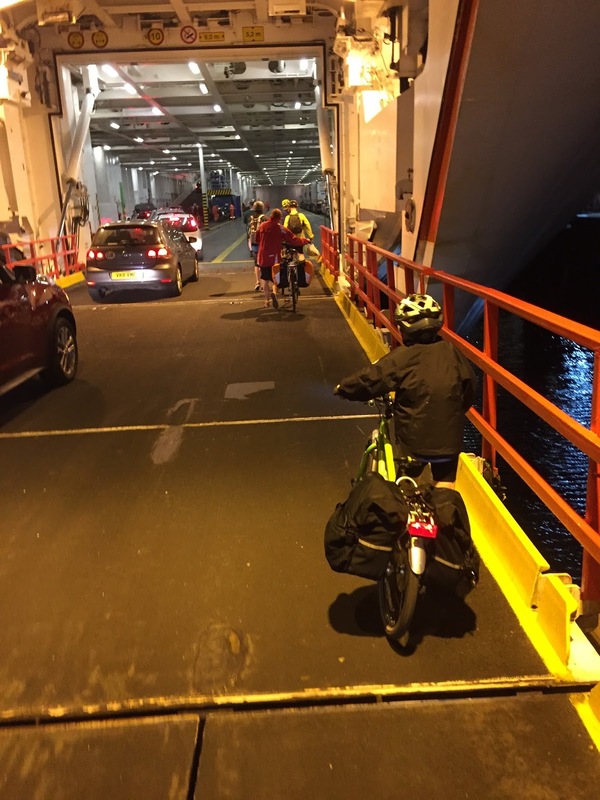 If we'd missed this ferry, we'd have had our work cut out making any of it work. We look forward to seeing them again to say 'thank you' once more when we get home.